On the evening of February 7, 2012, the Coalition hosted its Cooking for your Sweetheart with Diabetes at L’Ecole Culinaire Academy. The entertaining and informative chef delivered a great interactive presentation with hands-on demonstrations and sampling of ratatouille, crepes and quinoa chili chicken…. three dishes that we found to be absolutely mouthwatering… and good choices for people with diabetes. Given the success of this program, plans are underway to deliver more hands-on programs centered on food in the future. The Coalition welcomes ideas and partners to help further develop this mini-cooking school concept. Like all Coalition program, participants were informed about ways to increase their diabetes self-management skills through services like Kick Diabetes. The St. Louis Diabetes Technology Expo provides attendees with a look at how new technology is changing diabetes management. Health care professionals and researchers will present information about on-the-market advances in medication, blood glucose monitoring and nutrition. The Expo also features a product showcase which allows attendees to test the latest products and talk with company representatives. Register for Live Well STL (Jul 21): Should diabetes be the ONE shared health improvement area for the region? 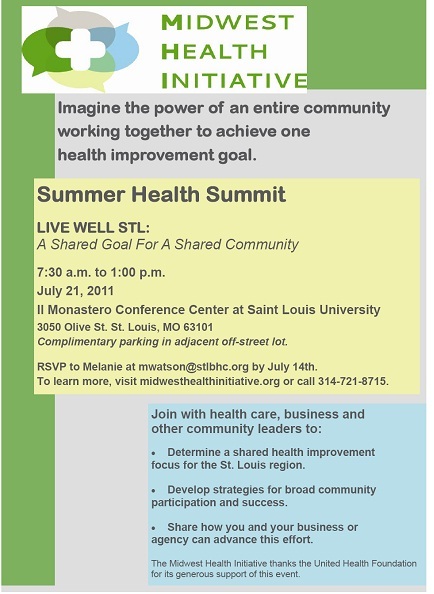 On Jul 21, the Midwest Health Initiative (MHI) will host LIVE WELL STL, a summer summit meeting of community leaders who will be deciding how MHI will focus its health improvement efforts. One goal of the event is to decide what should be the ONE shared health improvement focus for the St. Louis region. Friends of the St. Louis Diabetes Coalition are invited to this forum on Thursday, July 21, 7:30 a.m. to 1:00 p.m. @ Saint Louis University Il Monastero Conference Center. Should diabetes be the ONE shared health improvement area for the region? Come and share your opinions, experiences and ideas as MHI stirs up dialogue about community health. To RSVP, please contact Melanie Watson at mwatson@stlbhc.org. SLADE will be hosting its Spring Dinner Meeting at Spazio Westport on Wednesday May 18. 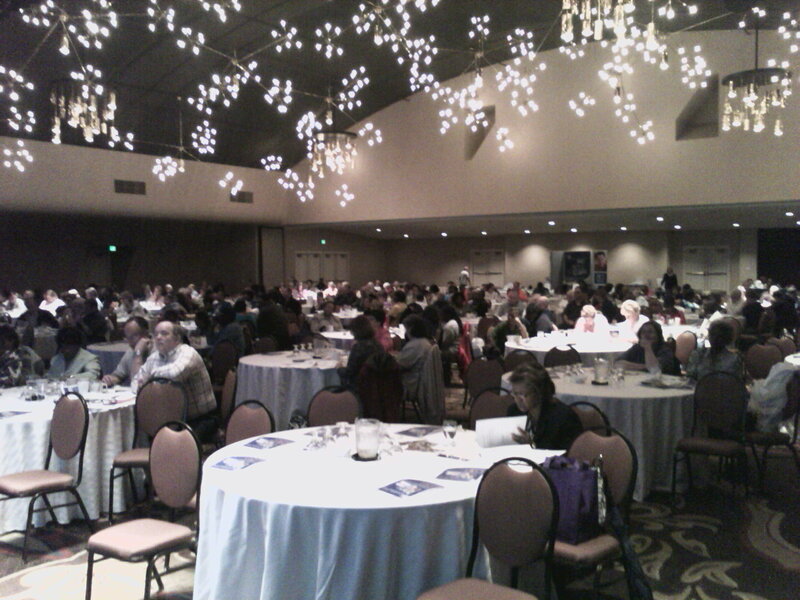 On Sat May 14… 258 people gathered at the fabulous Chase Park Plaza Ballroom in St. Louis to be part of So What Can I Eat?, a community diabetes education program presented by the St. Louis Diabetes Coalition. Joan McGinnis, MSN, CDE introduced featured speaker Pat Speirs, RD, CDE of Loyola University Chicago, who delivered an practical and inspirational presentation that focused on carb counting. She and Dr. Eric Armbrecht, PhD fielded excellent questions from attentive and engaged participants who had come from all over the region. This outstanding event was made possible by the generous support of Roche Accu-CHEK, Novo Nordisk and promotional assistance of many partners, including Personal Care Products, Liberty Medical, Visiting Nurses Association, Washington University Diabetes Center, Saint Louis University, SLUCare, JDRF, American Diabetes Association. Questions and comments by the participants re-affirmed a belief that the #1 question of people with diabetes still is: So What Can I Eat?. Participants were invited to join the Coalition’s newest program to provide diabetes self-management support — KICK Diabetes. Thank you to the team of 8 volunteers who helped check-in all of the participants. What a great day!!!! On Saturday, May 14, the St. Louis Diabetes Coalition presents So What Can I Eat?, a community diabetes eduction program, at the Chase Park Plaza Hotel. This free event featuring a nationally-acclaimed nutritionist from Chicago is being sponsored by Roche ACCU-CHEK with promotional support from many partners as part of the Coalition’s new Kick Diabetes service. 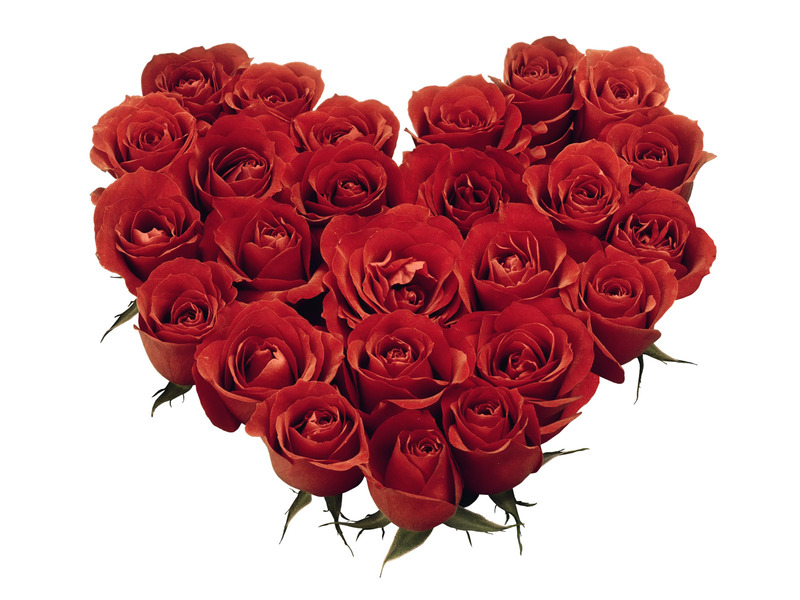 Doors open at 9:15 AM, program from 9:45 – 11:15 AM. Complimentary parking and continental breakfast . Registration required. Space is limited. Check out the program website and register here: www.SoWhatCanIEat.com. Please invite your patients and friends to this event. Ads have appeared in the St. Louis Review, St. Louis American and Kirkwood Webster Times… and radio spots on KMOX. Community organizations who are interested in recommending the KICK Diabetes program to their clients, patients, participants and/or members are invited to a luncheon at the Saint Louis University Salus Center on Friday, April 29, 2011, 12 noon. For more information, please contact the Coalition at stldiabetes@gmail.com.